Deep inelastic scattering experiments (DIS) provided the initial motivation for the development of a hadron constituent model. Deep inelastic electron-proton scattering experiments of the 1960s1 revealed a surprising weak fall-off of the deep inelastic cross sections with increasing and exhibited a scaling behavior previously predicted by Bjorken (Bjorken, 1969). Both observations strongly suggested the existence of a substructure in protons and neutrons. A preceding constituent model proposed by Richard Feynman offered a simple dynamical interpretation of the DIS results. Feynman postulated partons as the elementary constituents of hadrons, yet specified their identity only as far as basic particles relating under the strong interaction. Further development linked the parton model with the concept of quarks. Quarks, which were proposed independently by Gell-Mann (Gell-Mann, 1964) and Zweig as mathematically convenient building blocks of unitary symmetry, were the natural candidates for these elementary constituents. The early constituent quark model faced significant obstacles. To begin with, quarks had never been observed directly. The fact that quarks were never observed should have been explained by very strong interactions in their final state. The theory, however, required that the constituents of hadrons behave as free particles during virtual photon absorption. In addition, experimental results demanded significantly more than three constituents within the nucleon substructure. Resolving these, as well as additional inconsistencies, led to enhancements in the quark model and to the development of quantum chromodynamics (QCD). This resulted in a powerful, yet significantly more complex theory, postulating the additional concepts of gluons, colors, sea of quarks, quark confinement and the property of asymptotic freedom, with heavy reliance on renormalization techniques. where is the fine structure constant. The experimental data is often presented in the form of the nucleon structure functions and after being subjected to a series of data processing routines, such as radiative corrections and Monte Carlo simulations, which are heavily dependent on the assumptions of the QCD model. The incorporation of these underlying assumptions within the data complicates the ability to apply the data to a new theory with an entirely different set of assumptions. Therefore, the following discussion will present evidence that the UG theory predicts DIS behavior using a related, yet not identical set of parameters. According to the QCD model, the strong force acts between quarks and is mediated by gluons, while lepton-nucleon interactions are viewed as an electromagnetic interaction between charged leptons and charged quarks within the nucleons. Therefore, according to quantum chromodynamics, the fundamental process in DIS experiments is the electromagnetic scattering of two spin- point-like particles. In contrast, the UG model holds that there is no fundamental difference in the interactions between two nucleons, two leptons, or interactions involving a lepton and a nucleon. All of the above particles have a charge,3 a mass and a spin, and are assumed to interact with each other in accordance with the theory of unified gravitation and the electromagnetic theory.4 According to the proposed UG model, the large scattering angles observed in high-energy collisions between a nucleon and a lepton are mainly attributed to the UG zone structure between the two colliding particles, rather than to electromagnetic interactions between the lepton and a hadron with a substructure composed of several elementary constituents. Historically, the quark-parton model (QPM) grew out of an attempt to provide a simple model to explain the results of the early deep inelastic scattering experiments, where the function was discovered to be independent of at . QPM assumes that the nucleon consists of non-interacting point-like particles which serve as scattering centers. In contrast, according to the UG model, the UG gravitational field produced by the interaction between a rapidly approaching particle and a nucleon is viewed by the particle as an �onion� with an infinite number of repulsive layers separated by attractive layers, where the layers consist of the potential energy maxima or minima respectively. It will further be demonstrated that due to relativistic spacetime distortion, the shape and size of the �onion� and its layers are strongly affected by the momentary speed of the approaching particle, and may change drastically as the speed of the particle is reduced near the point of closest approach during a DIS event. The number of layers penetrated by the electron will be shown to depend mainly on the initial energy of the probing particle and on its impact parameter. Therefore, the idea of scattering by a sea of quarks is replaced by the concept of scattering via some of an infinite number of UG zones, where the zonal indices that contribute to the scattering are mainly determined by the impact parameter and by the overall energy of the probing particle. The following analysis deals with a DIS collision between a nucleon and an electron. Note that the discussion is not limited to a collision between an electron and a nucleon, and may be extended to cover collisions between any two leptons, two nucleons, a lepton and a nucleon, or between any two massive particles. However, the discussion is limited to cases where the probing particle survives the collision. Figure 11-1a: An electron with an impact parameter of B approaches the nucleon at a velocity that corresponds with in the direction parallel to the axis. At this speed, the potential energy due to the UG force is provided in cyan and the electromagnetic force is provided in red for the case where the nucleon is a proton. The UG pattern (cyan) remains stable as long as the electron is located at sufficient distance from the nucleon and its velocity is about constant. As the electron approaches the nucleon, its UG potential energy increases abruptly to equal the overall energy of the electron (at about ), causing the electron to decelerate. As the electron�s velocity is reduced, the UG pattern and the Coulomb potential energy collapse toward the proton, demonstrating the folding of the zonal structure described in section XI-2-2. Figure 11-1b: Provides the contributions of the UG and the electromagnetic potential energy patterns as perceived by the electron after its speed is reduced to non-relativistic velocity, where . where . Note, however, that at distances less than or of the order of the electron�s impact parameter , the azimuth angle starts to vary substantially along the trajectory of the electron. Consequently, at these small distances, equations 11-10 to 11-12 are not entirely accurate for relativistic electron velocities, while 11-9a and 11-9b remain accurate at non-relativistic velocities. Before diving deeper into a UG analysis of deep inelastic scattering, it is important to determine the highest level of precision that can be achieved in calculating how close the electron came to the nucleon. The natural tendency is to assume that the quantum uncertainty principle restricts the level of precision of this distance. This is the case, according to quantum mechanics, when the forces acting between the particles are Newton�s gravitational force and/or the electromagnetic force. However, this is not the case for the exponential UG force. which can be reduced to at non-relativistic electron velocities. As demonstrated in the figure, below the UG force is virtually zero, and is thus negligible relative to the Coulomb force in the case where the interacting nucleon is a proton.10 Moreover, throughout the range of distances associated with the maxima and minima to , the uncertainty principle forces the energies to become so high that any effort to accurately localize the electron in relation to the nucleon is doomed to fail. However, due to the rapid exponential growth of the UG interaction, the UG potential energy dominates over the Coulomb interaction at , and over the kinetic energy associated with the uncertainty principle at , which is roughly associated with energy levels above . At energies higher than or of the order of (for ), quantum effects become negligible and the scattering can be localized and viewed using classical physics methodology, thus making it possible to locate the zone of closest approach in spite of the uncertainty principle.11 Consequently, classical (non-quantum) methodology should provide a reasonable approximation and will be used here for the analysis of high-energy DIS events. According to equation 11-8 for the non-relativistic case , the strength of the UG interaction between two nucleons, or between a nucleon and an electron at a distance of is negligible. Therefore, the effective range of the UG force on the nuclear scale, for the case of non-relativistic electrons, is less than . Consequently, a non-relativistic electron of an impact parameter of would demonstrate exclusively an electromagnetic interaction with a proton, and virtually no interaction with a neutron. Under these conditions, the interaction is too weak to create substantial inelastic scattering. According to equation 2-1-1 and 2-1-2, at non-relativistic velocities the UG interaction is comprised of a central force that is independent of the speed of the electron relative to the nucleon. However, as shown in equations 11-4, 11-6 and 11-7, at relativistic velocities the UG potential energy is indirectly dependent on the electron�s velocity due to relativistic spacetime distortions and due to relativistic mass�energy equivalence. Therefore, at parametric distances where a low-velocity electron is anticipated to remain unaffected by its UG interaction with the nucleon, a relativistic electron may be significantly influenced. Hence, the effective range of the UG interaction may depend heavily on the relative velocity of the electron. Therefore, at distances of less than , the UG interaction between a proton and a non-relativistic electron (relative to the proton) becomes stronger than the electromagnetic interaction between them, yet becomes weaker than their electromagnetic interaction at distances greater than . The same calculation shows that the range of the UG dominance is extended by a factor of about 2,172 to in the case of a relativistic electron, where . In high-energy head on collisions, a large amount of energy is converted to potential energy by the electron as it encounters the point of closest approach with the nucleon. During this process, the momentum and the velocity of the electron relative to the particle accelerator�s frame of reference are drastically reduced. To preserve the overall momentum, the nucleon�s momentum, and therefore velocity, must increase significantly. However, since the nucleon is strongly bonded to other nucleons within the atomic nucleus, and the atom itself is bonded to other atoms or molecules, a substantial portion of the transferred energy and momentum are dispersed to the surrounding nucleons and molecules. These losses of energy and momentum, as well as additional loss of energy and momentum in the form of radiation, result in an inelastic scattering, where the final energy of the electron (as viewed in either the reference frame of the particle accelerator or of the nucleon) reduces significantly. The amount of change in the energy and momentum of the electron depends strongly on its initial energy and momentum, and on its impact parameter. The explosive growth of the exponential term of equation 11-4 as a function of at distances of , as well as the sharp increase in the frequency of the oscillations of the cosine term as , cause the trajectories of the probing electrons to behave in a chaotic manner. This behavior appears to be random, as a minute difference in an electron�s initial impact parameter or velocity may result in drastically different scattering angles, as well as in a different final momentum and energy. Therefore, although the overall magnitude of the electromagnetic interaction in high-energy deep inelastic scattering is very small compared with the UG interaction, the electromagnetic effect may be significant in such a chaotic system, where a tiny perturbation may result in an entirely different trajectory. Consequently, regardless of the fact that the initial energy and momentum of all of the electrons in the beam are virtually identical, the trajectories of different electrons may vary considerably. Thus, the point of closest approach between different electrons, and their amount of energy and momentum at these points, may vary substantially. In experiments using particle accelerators the velocities of the probing electrons within a beam are all virtually equal. Therefore, the most influential factor in determining the characteristics of the scattering event is the impact parameter of the electron, and to a lesser degree, whether the nucleon is a proton or a neutron. In cases where the impact parameter of the electron is sufficiently small, the electron will approach the first impenetrable maximum barrier, where the electron�s potential energy at its peak exceeds the overall energy of the electron. This outer maximum is expected to have an odd integer index, denoted as the maximum. As the overall energy of the electron is insufficient to penetrate the barrier, the electron will either be deflected to the side or scattered backward by the barrier, in either case demonstrating a large scattering angle and a substantial loss of energy. In high-energy DIS collisions, the rate of reduction of the UG amplitude as a function of an increasing parametric distance is high, and the slopes of the barrier at high zonal indices are extremely steep. Consequently, the electron�s energy must have been greater than the maxima of most of the preceding zonal maxima encountered prior to the point of closest approach, and the electron�s trajectory should have been minimally affected by the majority of these preceding zones. Therefore, the electron will be scattered by the maximum zone in the same manner as it would be scattered by a hard object of the same approximate shape as the contour of the zone barrier, where the electron�s kinetic energy is equal to zero. The UG zonal structure generated by the interaction between the nucleon and the electron consists of an infinite series of concentric barriers around the nucleon, where the height and density of the barriers approach infinity as . At non-relativistic velocities, these concentric barriers are spherical and their distance from the nucleon is independent of the electron�s velocity. However, in the case of relativistic electron velocities (relative to the nucleon), the shape of the barriers begins to resemble a series of elongated ellipses, where their major axes are aligned perpendicular to the velocity of the electron. The heights and locations of these barriers, which are fixed in the case of non-relativistic electron velocities, become highly dependent on the speed of the electron at relativistic electron velocities. Where, the small contribution of the particles� spin is neglected. At DIS events, the UG maxima must be located at sufficiently short distances, where the Coulomb term is negligible relative to the UG potential energy. Furthermore, at such high energies the term within the parentheses is insignificant compared with the large exponent term required for DIS and can be dropped. The point of closest approach, denoted as , generally occurs in the case of DIS somewhere within the zone, but is assumed for the moment to occur very close to the zonal maximum. Therefore, at this point in space and time, and . Consequently, provides the actual distance between the electron and the nucleon, as viewed in the rest frame of the nucleon. In the general case, the electron�s velocity may be substantial, or even relativistic, and the resultant electron scattering would not be highly inelastic. However, as discussed, for a DIS event to occur where and , the electron should become non-relativistic at the point of closest approach , with and . Therefore, , , and . For example, provided that , the first maximum contour at which the potential energy of the electron exceeds its initial overall energy is indexed . Note that energy losses may reduce to an odd . Intuition would suggest that as the electron was stopped by the maximum, it should have passed through all minima and maxima of , and could not have reached any of the minima and maxima of index . This will not be shown to be the case, however. While the electron indeed had to pass all minima and maxima of , it will be shown that the electron also had to pass maxima and minima between and . For the example of , at the point where or , the calculated index of the last encountered maximum is given by and respectively, which are obviously much larger than the index of . Therefore, before being stopped by the nucleon at the maximum, the electron managed to pass substantially more than zones. The question arises as to how it is possible that an electron in motion towards a nucleon, after successfully passing through zones, ended up being stopped by a maximum barrier of an index as low as . After all, the electron could not have reached the zone without first passing through all of the maxima. Additionally, the electron�s potential energy at the maximum should be substantially higher than its potential energy at the maximum. Therefore, it seems odd that the electron could be stopped by a low energy maximum barrier after having passed a substantially higher energy barrier earlier. With the example used above, where , the ratio in regions where is given by , compared with in regions where the electron moves at non-relativistic velocities. The ratio of the electron�s potential energy between the maximum viewed by the electron at close to zero velocity (where ) and the maximum viewed at is given by . Therefore, the potential energy of the non-relativistic electron at the time it was stopped by the maximum substantially exceeds the potential energy of the relativistic electron of at the maximum. This explains how an electron can have a sufficient amount of energy to pass the maximum barrier, yet not enough energy to pass the earlier maximum barrier. However, the above explanation does not account for how an electron that just passed the zonal maximum indexed 135,115 can encounter the same maximum for a second time while still moving toward the nucleon. The explanation is as follows: While the parametric distance is reduced monotonically as the electron approaches the nucleon, the apparent distance of the electron from the nucleon fluctuates wildly, at times increasing and at times decreasing with the reduction of . As it moves through the zones toward the nucleon, the electron accelerates when approaching a potential energy minimum and decelerates as it approaches a maximum. When approaching a potential energy maximum, and decrease. Consequently, the apparent distance between the electron and the nucleon (as viewed by the nucleon), as well as the potential energy ratio between two successive maxima (or minima), increases. The opposite occurs when the electron approaches a minimum, in which case and increase, and the apparent distance between the electron and the nucleon (as viewed by the nucleon), as well as the potential energy ratio between two successive maxima or minima, decreases. In effect, as demonstrated by figures 11-1a and 11-1b, the entire zonal pattern folds in when the velocity of the electron is decreased, causing the pattern�s maxima and minima to move inward toward the nucleon. Conversely, the pattern unfolds when the velocity of the electron is increased, as the maxima and the minima move outward, away from the nucleon. The speed of folding or unfolding depends on the rate of change of the electron�s Lorentz factor . Early on, when the distance between the electron and the nucleon is relatively large and the UG interaction is quite weak, the relative velocity of the electron is about constant, and the rate of folding and unfolding of the UG pattern is negligible. In a DIS event, as the electron approaches the point of closest approach the maxima and the minima fluctuations become enormous, causing related fluctuations in the value of . The size and rate of these fluctuations determine the speed and the extent of the folding and unfolding of the pattern. The speeds of the few folds preceding become large and may exceed the velocity of the electron. Hence, some of the maxima already passed by the electron may fold or unfold at a significantly faster rate than the speed of the electron, thus overtaking the electron. It is therefore feasible, and even expected, that in a DIS event the electron will encounter the same maximum or minimum multiple times as it moves toward the nucleon. The overall energy of the electron illustrated in figure 11-3a is lower than its potential energy at the maximum. As the electron passes the maximum, its overall energy is significantly larger than its potential energy. Note that the electron retains most of its kinetic energy; therefore only a small portion of its energy can be transferred to the nucleon, and subsequently dispersed to nearby nucleons, atoms and molecules. When the impact parameter of the electron is larger than , the electron will not reach the maximum , and the amount of energy lost is relatively small. As a result, the scattering event is only slightly inelastic. At an impact parameter of , the electron passes the higher potential energy maximum , and a greater portion of its kinetic energy is transferred directly to the nucleon and indirectly to nearby nucleons, atoms and molecules. Consequently, the scattering becomes increasingly inelastic. At an impact parameter of , the electron proceeds toward the maximum. Since the electron�s potential energy at this maximum exceeds its overall energy, the electron�s motion toward the nucleon is halted as it reaches the point at which its potential energy is equal its overall energy, at .17 As the electron does not have sufficient energy to continue to move toward the nucleon, it is scattered in the same manner as it would have been scattered by a hard object. Note that as the overall energy of the electron at the impact point is equal to its potential energy, the velocity of the electron relative to the nucleon is reduced to and its Lorentz factor is reduced to . Since the electron becomes non-relativistic on impact, the UG zones viewed in the particle accelerator�s frame of reference appear spherically symmetric around the nucleon, and the hard scattering object becomes a hard scattering sphere of radius . Hence, the high-loss DIS cross section becomes approximately equal to . Note that the higher the energy of the probing electron, the smaller the radius of the hard sphere becomes. when . Therefore, as increases, the DIS cross section is reduced. However, as increases, the DIS cross section fall-off becomes exceedingly weak. This phenomenon is demonstrated in figures 11-3b to 11-3d. 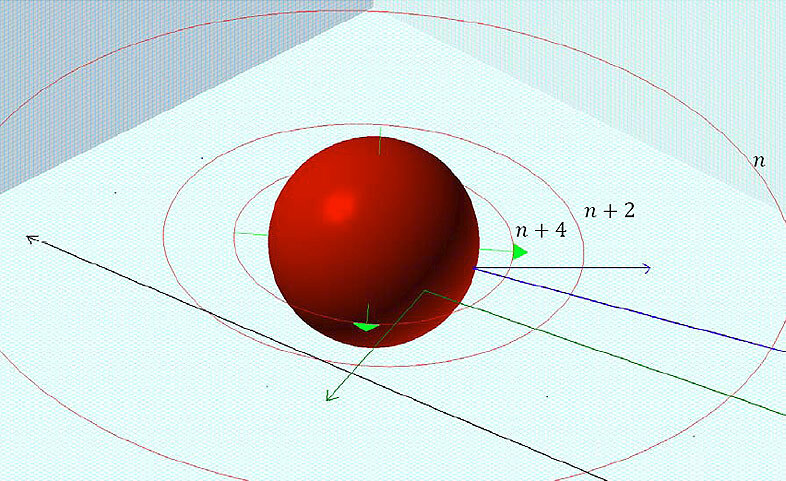 In figure 11-3d the impact energy of the electrons is further increased to about , resulting in the reduction of the radius of the hard sphere to . As shown in the figure, at high zonal indices the spherical maxima become compacted together to the extent that increasing the electrons� energy by a large factor results in little reduction in the radii of the hard sphere, thus diminishing the rate of reduction of the DIS cross section. Recall that close to the impact point where the electron�s velocity is no longer relativistic, the effect of any zone is smaller than the �hard sphere� effect of the zone by a factor of at least . Thus, the effect of any zone can be regarded as negligible.19 The trajectory of the electron can consequently be expected to be deflected slightly by the maxima and , and by the minima and , before colliding with the hard sphere of a radius greater than , where is the radius of the maximum contour. In summary, the highest DIS losses occur when the electron�s impact parameter is sufficiently small. 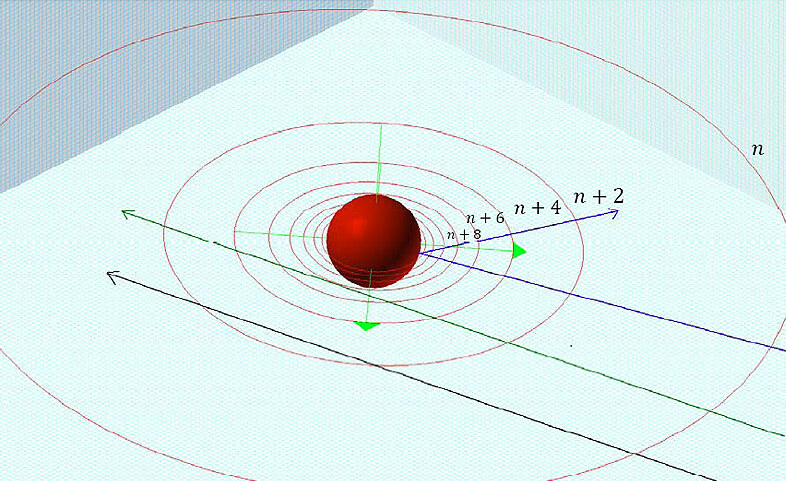 As a result, the electron is scattered as it would have been scattered by a hard sphere, where the radius of the sphere is equal to the distance of the point of closest approach . On the other hand, in cases where the impact parameter of the electron is sufficiently large, the energy of the electron at the point of closest approach (located at zone is higher than the maximum potential energy of zone , thus . In this scenario, the electron will not collide with the hard sphere and its velocity at the point of closest approach may still be relativistic. As the potential energy of the electron reduces drastically with its distance from the nucleon, the scattering becomes more elastic with an increased impact parameter. Armed with the above insights, the task at hand is to apply the same principles and approximations for the development of a more precise mathematical description of the weak fall-off of the DIS cross section. At the point of closest approach (viewed in the frame of reference of the particle accelerator), the electron�s velocity is either zero or perpendicular to and ). Therefore, the dynamics of the interaction at that point are determined by equations 11-7 and 11-12. However, the electron�s energy at the point of closest approach is not observable. To simplify the analysis, it is assumed that (or alternatively, ) is a monotonic function of the electron�s initial energy and its final energy (or ), and that its behavior is consistent with20 and, on average, , , and . To calculate the approximate scattering cross section, we begin once again with a high-loss DIS event where the impact energy of the electron is slightly lower than and its impact parameter is sufficiently small to produce hard sphere scattering. Therefore, is slightly larger than . In this case, the maximum contour cannot be penetrated by the probing electron, which can only reach as deep as . As the electron�s velocity is already reduced to a non-relativistic speed near the point of closest approach, the shape of the maximum is perceived by the electron to be spherically symmetric. As discussed, in the case of a DIS event, the sharp steepness of the UG exponent as a function of distance is so explosive near the point of closest approach that the electron�s course and direction of motion remain largely unaffected by most of the UG maxima and minima encountered, with the exception of the last few extremely narrow zones between and . Therefore, the interaction distance and the interaction time associated with DIS events, during which the electron�s overall energy and direction of motion have been significantly altered, are extremely short. For this reason, although the electron�s direction of motion may have changed substantially, the effect of this change on its impact parameter is minimal. Consequently, all electrons with an impact parameter of and an impact energy of will scatter in the same manner as they would have been scattered by a hard sphere of radius . Electrons of the same range of energy, with impact parameters within the range (as calculated for non-relativistic electrons) may undergo a weak inelastic scattering, while electrons with impact parameters of will undergo an elastic scattering, or will remain unaffected. which also provides a similar weak fall-off of . Bjorken scaling, demonstrated in figure 11-7, is the observed high-loss DIS behavior where and when and . As discussed, high-loss DIS events adhering to and occur when the electron is scattered by a hard sphere of radius , where the velocity of the electron at the impact point of yields . From the UG perspective, scaling becomes apparent when the UG force dominates over the electromagnetic interaction and over the range of energy affected by the uncertainty principle. Therefore, according to section XI-1-2, . The physical underlying principle that leads to the observed Bjorken scaling is demonstrated in figures 11-4a to 11-4e. The illustration in figure 11-4a provides a tilted three dimensional image of the UG potential energy. The illustration displays only three consecutive maxima and one visible minimum out of an infinite set of maxima and minima in the vicinity of the maximum. 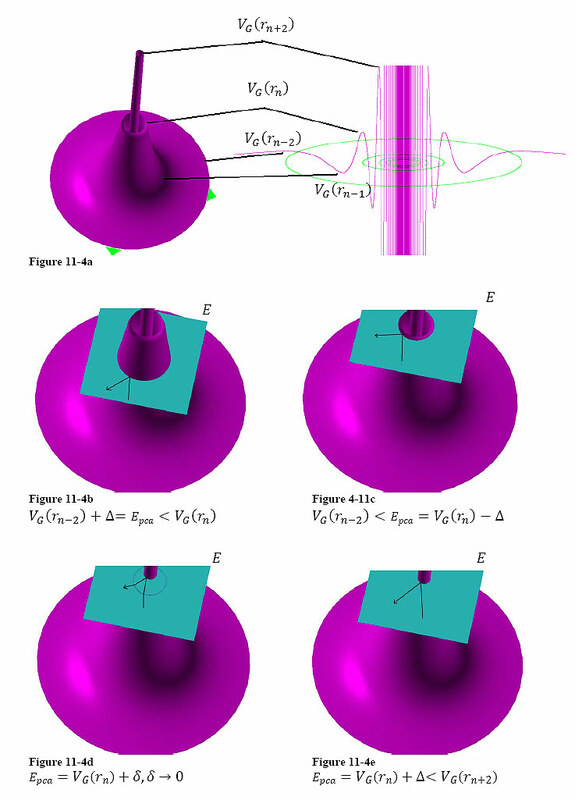 Figure 11-4b provides an illustration of the three dimensional geometry of the deep inelastic scattering of the electron by the zone at , where the blue area resides on the plane and is the energy of the electron on impact (at ). The electron�s energy is thus given by , where is small relative to . Consequently, the electron contains sufficient energy to pass the maximum, but not enough energy to penetrate the zone. The DIS cross section is equal to the circular area contained within the outer circumference defined by the intersection of the three dimensional UG surface with the blue plane. At a higher electron energy, where is just below the maximum , as shown in figure 11-4c, the electron collides with the zone at a point slightly external to and the DIS cross section is slightly reduced. Note that as the energy of the probing electrons changes continuously between (approximately between the energy levels shown in figure 11-4b and 11-4c), the DIS cross section reduces continuously, and becomes almost a linear function of the electron�s energy level. However, as the energy becomes infinitesimally larger than , the electron has sufficient energy to pass the maximum. As the electron passes through , its potential energy begins to fall drastically, and its velocity increases as its potential energy is converted to kinetic energy. After crossing the minimum, the electron�s potential once again increases until colliding with the zone containing the higher maximum at the point locatedbetween . Consequently, the DIS cross section is reduced by more than . Therefore, as the energy of the electron in the vicinity of changes from being infinitesimally lower than the maximum to infinitesimally higher than , the DIS cross section reduces abruptly, resulting in a discontinuity. Such a transition is demonstrated in figure 11-4d. As the electron�s impact energy increases continuously between , the cross section will reduce continuously until the energy of the electron becomes equal to , where another discontinuity occurs. Hence, a discontinuity is expected to occur when the energy of the electron at the point of impact is equal to its potential energy at any given non-relativistic UG maximum. It will be shown that the reduction of the DIS cross section can be described to depend on two independent parameters. The first parameter is the zone index that determines the electron�s impact energy levels at which discontinuities in the DIS cross section occur, as well as the DIS cross section values on either side of each discontinuity. The second parameter controls the approximately linear relationship between the DIS cross section and the electron�s energy at the point of closest approach, within the range of energies lying between two successive maxima. Note that at high zonal indices the slopes of the UG potential energy become extremely steep (as demonstrated by figure 11-3a), and the difference between the radii of two successive maxima becomes negligible. At the energy range between the two maxima there is no notable change in the cross section or in the radius of the hard sphere, consequently creating an effect similar to Bjorken scaling, where the cross section depends on a single parameter (in this case, the potential energy maximum index). However, at low zonal indices the slopes are less steep, and the difference between the radii of two successive maxima is significant. Therefore, in the energy range between the two maxima, the radius and cross section of the hard sphere change notably as functions of the electron�s impact energy , thereby creating a visible break in scaling at low DIS energies. Consider the case where the electron�s impact energy is just under the potential energy of at the maximum. Therefore, an electron with a sufficiently large impact parameter of avoids collision with an impenetrable hard sphere, as demonstrated in black in figure 11-3b, or in black and green in figure 11-3c. In such cases, an electron with an initial impact parameter of will have sufficient energy to penetrate the zone and to reach the zone. As the maximum and the minimum are not negligible relative to , the electron will be deflected as it passes the maximum, and again as it passes the minimum. These deflections influence the energy and momentum of the electron, and therefore its direction of propagation. However, as the combined width of these zones is extremely narrow, the deflections exert little effect on the actual location where the electron encounters the zone. Therefore, whether or not the given electron collides with a hard sphere depends mainly on the electron�s initial impact parameter .28 With , the electron does not have sufficient energy to penetrate the zone, and consequently, in the case of , the electron is deflected by a hard sphere and its forward motion toward the nucleon is halted at the impact point. In the specific case of a high-loss DIS event, where the energy lost by the electron and , the scattering angle approaches and the electron�s relative velocity at the point of closest approach (or impact point) becomes about zero, leading to . Note that it was taken into consideration that the rest mass of the electron as well as its nearly diminished kinetic energy at the impact point are negligible relative to the impact energy . Since the electron is scattered by a nearly hard sphere of radius , its cross section is given by . Consequently, the minimum value of is at the limit , and as the distance between the point of closest approach and the nucleon converges toward . On the other hand, the maximal value of , denoted , is associated with the minimum energy with which the electron can penetrate the zone as it approaches and recedes from the impact point on its way to the detector. This energy value is significantly more difficult to calculate for several reasons. First, the velocity of the electron as it encounters the maximum is unknown, and may be relativistic, and consequently may affect the height and the perceived location of the maximum. In addition, the amount of energy lost by the electron during the time it spent between the distances of the maximum and is substantial, thus the energy of the electron as it passes through the maximum is uncertain. However, it is clear that , where is the radius of the maximum, as perceived by a non-relativistic electron. In the case of an electron with an impact energy of , where , and an impact parameter of , the electron will escape the zone without colliding with its impenetrable hard sphere. The electron will then re-enter zone on its way toward the detector, while retaining a non-zero and possibly relativistic velocity at the point of closest approach within the zone. At an impact parameter just above , the scattering may still be significantly inelastic, however, as the value of approaches , the scattering becomes less inelastic. Consequently, DIS cross sections demonstrate discontinuity at energy levels that match the potential energy of the zonal maxima. In the case of a close encounter between the electron and the maximum, the cross section reduces abruptly from to . As the electron�s impact energy continues to increase between and , the cross section decreases gradually toward . The next discontinuity occurs at the energy , where the cross section reduces abruptly from to . This pattern of discontinuities, or scaling gaps, depicted in Figure 11-5 will be shown to occur, and to provide a scaling phenomenon that is similar to Bjorken scaling. Figure 11-5: Provides an illustration of the DIS cross section of particles such as electrons by a nucleon (note that for the purpose of clarity, the mass of the scattered particle used in this example is slightly larger than mass of an electron, allowing for the clear identification of more than three maxima in the graph). The figure further includes the curve of , which is proportional to the hard sphere cross section of a zone. The multiplication factor is included in order to allow the hard sphere cross section to be displayed in the same figure, along the zone energies. Discontinuity in the cross section can be noted at every maximum, creating cross section �scaling gaps� between the zones and generating a phenomenon similar to the observed Bjorken scaling. The degree of curvature of the cross section between any two successive discontinuities becomes increasingly insignificant as and reduce, and as increases (where the zone maximum index, given by an odd integer , is analogous to , where is the Bjorken scale variable). This increase in the cross section curvature at low k indices (low values) explains the break in scaling at low values of . Consequently, deep inelastic scattering results in a series of discontinuities that resemble the behavior of Bjorken scaling. The next step is to determine the behavior of the double differential cross section as a function of and the zonal index . where according to equation 11-4-4c, . Figures 11-6a and 11-6b illustrate the resulting scaling behavior by displaying the �hard sphere� cross section as a function of . Each waveform is associated with the inelastic scattering produced by electron collisions with a given zone, where is an odd integer. Figure 11-6a: Display of the UG DISdouble differential cross section scaling, calculated via equation 11-4-25, due to repulsive zones above . Note that within the provided range of energies, where , the effect of the UG scaling may be masked by the much larger electromagnetic interaction, as well as by the effect of the uncertainty principle. Nevertheless, the figure is displayed in order to effectively demonstrate the scaling break that occurs at relatively low values. Figure 11-6b: Display of the calculated double differential cross section of a UG deep inelastic scattering in the range between and . Across most of this range of energy, the UG interaction dominates over the effects of the electromagnetic interaction, and the uncertainty principle. The displayed cross section provides clear scaling properties, as well as a break in the scaling at low values. The scaling pattern in figures 11-6a and b bears a resemblance to the observed Bjorken scaling pattern of the form factor provided in Figure 11-7 within the range of , where an odd is analogous to the Bjorken variable and the factor is analogous to . is almost independent of (thus resulting in the scaling phenomenon). At lower odd indices, where is not negligible compared with , declines with decreasing , generating the break in scaling observed for low (or low ) values. In either case, the DIS cross section fall-off with decreasing (or increasing and decreasing ) is significantly weaker than the elastic scattering (which falls off proportionally to ). As stated above, this weaker fall-off provided by the UG theory is consistent with reported experimental data in the range of . 2 Note, however, that the UG theory does not necessarily contradict the existence of quarks as elementary constituents of hadrons. 3 The electrical charge is equal to or , where denotes the charge of a proton. 4 Note that this book does not deal with the weak force, which is viewed by the standard model as a separate force. 5 To calculate , , where contracts to , . Thus, , or . 6 Note that in the general case, the electron�s potential energy depends on the vectors and . However, in cases where it is clear that either or are relatively insignificant, the notation or may be used. For example, see equations 11-6 for the case of , or equation 11-7 for the case of ). In cases of non-relativistic velocity, where becomes independent of , the notations or may be used. 7 Note that at , or when is perpendicular to , the potential energy is reduced to depend on and (or . At shorter distances, where approaches the impact parameter , becomes dependent on , and . In the non-relativistic case, depends exclusively on . Therefore, the notations and will be used interchangeably throughout this chapter. 8 The logic behind this statement is as follows: The initial energy of the electrons is fixed by the experimental setup. increases as increases and as . The energy loss of the scattered electron is not directly dependent on the scattering angle , but increases with decreasing . Thus, increasing will increase and decrease , and vice versa. Therefore, other than setting the highest possible value of the electrons� initial energy , high values of both and can be achieved when is within a specific range of energy values, and when the scattering angle is as close as possible to . 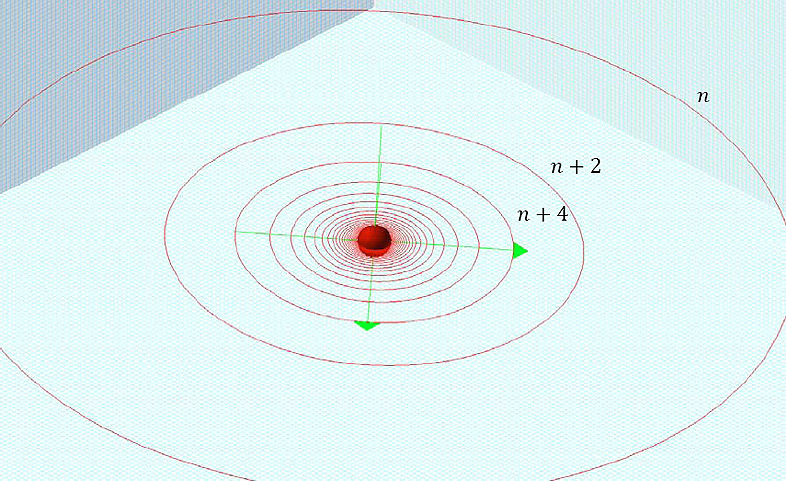 With this scattering geometry, the electron and the nucleon nearly undergo a head on collision, where the relative velocity of the electron nearly reduces to zero at the point of closest approach . Hence, . As will be discussed later on in the chapter, the electron in such a case is effectively scattered by a hard sphere. 9 Using equation 11-9b (or equation 11-12, where ) leads to . 10 Note that the distance between the electron and the nucleon increases with decreasing . 11 Note that this analysis does not imply that the electromagnetic interaction and the uncertainty principle are completely negligible at , as they may still bear some influence on the zero intersections of the gravitational potential energy . In addition, the electromagnetic force may pull the electron closer to the nucleon, thereby reducing its impact parameter. As previously noted, the impact parameter plays a crucial role in determining the outcome of the DIS event. 12 Note that the rest mass energy of the electron (of about ) is relatively negligible. 13 Note that at DIS events the nucleon demonstrates substantial acceleration. Consequently, its rest frame can be inertial for only a brief period of time. 14 Note that in deep inelastic scattering, the energy associated with the electron�s rest mass is negligible relative to its overall energy and therefore can be neglected. 15 As the nucleon is accelerated significantly during the DIS event, its rest frame is not inertial, and consequently, the overall energy and momentum of the system is not preserved. Therefore, is possible. While this frame of reference is not inertial over the entire period of the DIS event, it can be viewed as an inertial frame at any parametric distance for a brief period of time. Therefore, equation 11-2-4 is valid. 16 Note that lower mass values were used for the figures in this chapter in order to view more maximum and minimum peaks. 17 Note that the energy at the impact point within the nucleon�s frame of reference is not equal to the initial energy of the electron. This is due to energy losses endured, as well as to the fact that the nucleon�s frame of reference cannot remain inertial for a sufficient amount of time, due to the acceleration of the nucleon. 18 The index increase from to (by 10), rather than to (by 5) reflects that there are five minima in addition to the five maxima separating the radii of the two hard spheres. 19 Note however, that as the velocity of the electron was higher and may have been relativistic when passing through the previous maximum, the ratio between two successive maxima may reduce to below 13.59. 20 Note that the nucleon is accelerated by the electron. Therefore, its frame of reference can be regarded as an inertial frame for only a brief period of time. Consequently, the law of conservation of energy does not apply. 21The reason for the assumption that is that the electron had to pass the maximum just before impact with the zone, and then had to pass the maximum again immediately after the impact, on its way toward the detector. 22 Note that there is also a split of the potential energy maxima due to the slight difference in mass between the proton and the neutron, which may impact the number of resonances. 23 In cases where , the notations and may be used. 24 The DIS cross section can be written as . However, in the case of a negative value, the electron would remain trapped, and would never reach the detector. Therefore, cannot be negative. In addition, as the electron is extremely unlikely to gain energy during the scattering event, should be negligible. Therefore, the overall UG cross section can be expressed as . 25 In the non-quantum approach, the overall energy of the electron must be somewhat above as it passes through this maximum, otherwise the electron would not be able to enter and subsequently exit the zone, which contains , on its way toward the detector. 26 At even indices, is a minimum and its potential energy is negative. Therefore, it is possible that the velocity and the kinetic energy of the electron as it encounters these minima may be larger than their initial values. 27 Note that the potential energy maxima are odd integers, therefore is not continuous, and instead changes in steps of two. 28 Note that the UG and the electromagnetic interactions are both long-range forces. In proton-electron scattering, at all distances greater than nuclear scale, the UG contribution is negligible compared with the electromagnetic contribution (by a factor of approximately ) and can be neglected. However, at such distances the electromagnetic force reduces the impact parameter by pulling the electron toward the proton. This may explain why the cross section of a proton-electron DIS is observed to be larger than the cross section of a neutron-electron DIS as the Bjorken scale variable . 29 Providing that experimental data becomes available in this form (where the overall DIS cross section is dependent on and on odd , rather than on and ), the values of the UG constants and could be calculated with greater accuracy.